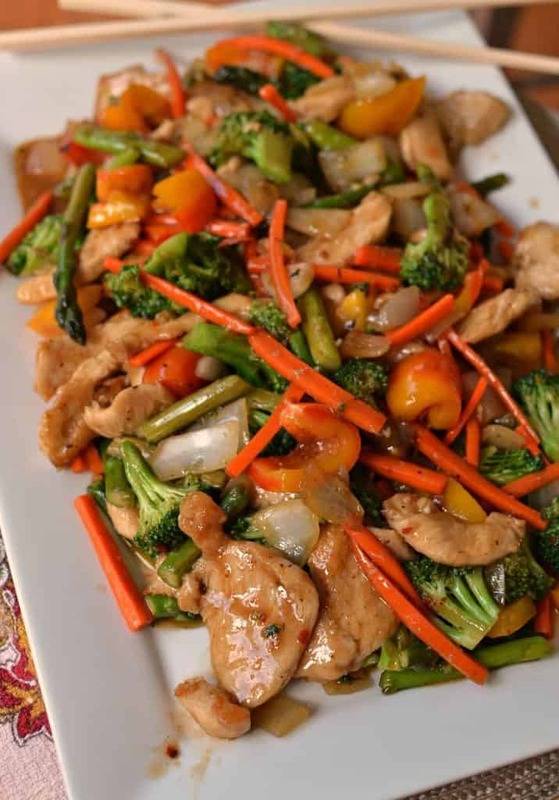 Basic Chicken Stir Fry is quickly made using seasonal vegetables, an easy chicken marinade and a simple gravy that can be adjusted to taste. Do you like stir fry but worry that you are not quite sure what you are doing? 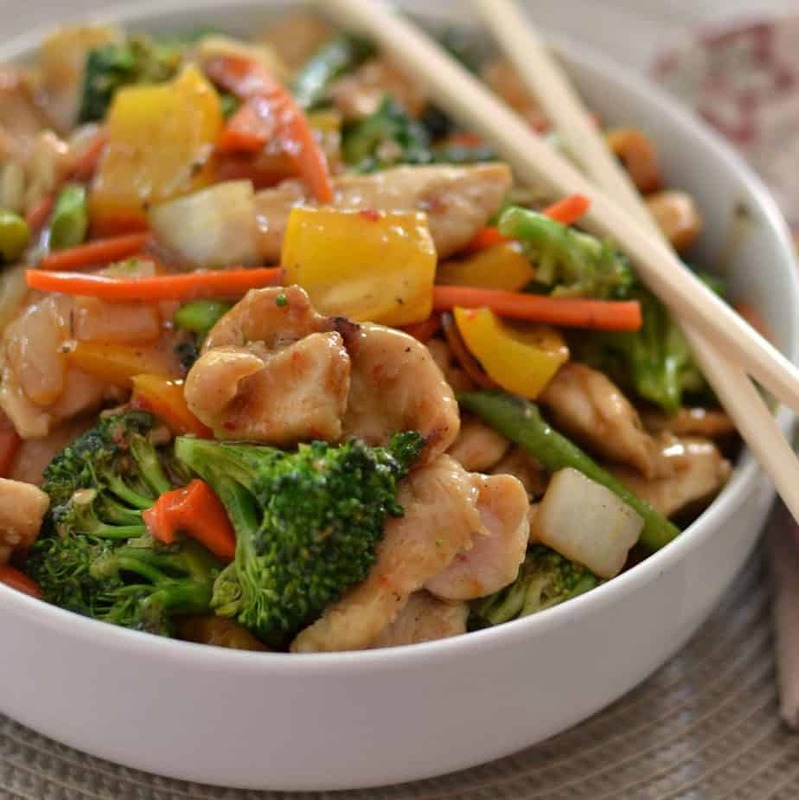 This Easy Basic Chicken Stir Fry will start you in the right direction. With a few helpful hints and some good advice anyone can make better than take out stir fry right at home. The other huge advantage to cooking your own stir fry meals is that you control the ingredients. If you don’t like onions substitute snow peas or water chestnuts. Are you on a sodium restricted diet? You can reduce the amount of soy sauce by half and make up the flavor by adding minced garlic or more sambel oleck to the gravy. How to make Easy Basic Chicken Stir Fry. As with all great stir fries this one starts with good quality diced vegetables. Not too small and not too large. When dicing or chopping my vegetables in preparation I think of being able to pick it up with chopsticks. Carrots do take a little longer to cook though so I cut them in matchstick style or very thin rounds. Broccoli also takes a little longer so I cut them in the small bite size range by splitting the florets in half or thirds. I cut the chicken in small thin bite size pieces and marinate with a little soy sauce, ginger, rice vinegar and cornstarch. I just dump it all in a large plastic bag and let sit for 30 minutes mixing it around every now and then. Now I heat up that wok or large skillet over high heat. Do NOT use a nonstick skillet as they can not handle this kind of heat. I add a tablespoon or two of an oil with a high smoke point like canola or peanut. I get the wok and oil good and hot. Using a pair of tongs I remove the chicken letting excess marinade drain off. I add the chicken to the wok or skillet in batches and cook just until done removing cooked pieces to large plate or bowl. Stir fry moves very fast so this is not the time to fold any laundry. Thin cut slices of chicken are done in less than five minutes. Pour another tablespoon of oil into the wok over high heat. Add the vegetables in batches. I usually separate my vegetables into three different batches; hard vegetables (like carrots, broccoli and cauliflower) semi hard vegetables (like onions, peppers, zucchini and mushrooms) and soft vegetables (like cabbage, spinach, tomatoes and snow peas). Hard vegetables are done in 3-4 minutes. I usually place the top of the wok on during the last minute for the broccoli to steam just a touch. Semi hard vegetables are done in 2-3 minutes at the most and soft vegetables are done in 1 – 1 1/2 minutes. All the vegetable need to stirred frequently so they do not burn. I remove them as they cook to the bowl with the chicken. I prepare the gravy using chicken broth, soy sauce, ginger, sesame oil, brown sugar, rice vinegar and cornstarch. If you like a little heat add a touch of sambel oleck or sriracha. I turn the heat on the wok to medium low and pour the liquid into the wok. Stir or whisk continuously until it thickens. I add everything back to the wok for a couple of minutes to reheat. Helpful hints for Easy Basic Chicken Stir Fry. 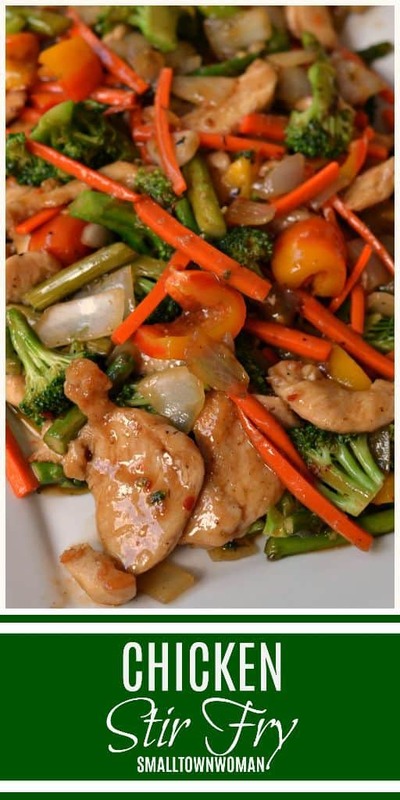 Cook the chicken and vegetables in a very hot wok so everything is stir fried crisp tender. Use an oil with a high smoking point like canola or peanut because you do not want your oil burning. Swirl it in the base of the wok. Don’t overcrowd the wok. Therefore work in batches. Vegetables should be dry so they stir fry not steam. Remove meat from the marinade with tongs to allow most of the marinade to drip off. You don’t want your meat to boil hence you want it to stir fry. Cook meat in a single layer so it can sear against the wok. 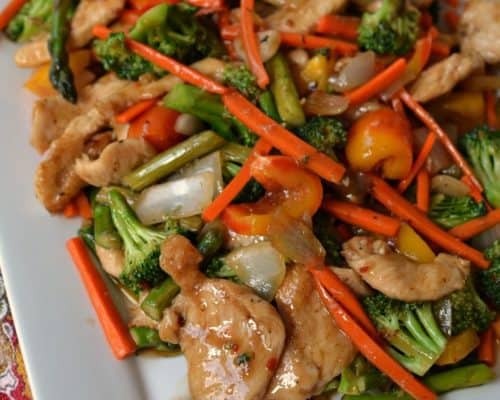 Cooking stir fry dishes is not all that difficult and can be accomplished with just a little forethought and practice. Other Asian dishes you will love!! 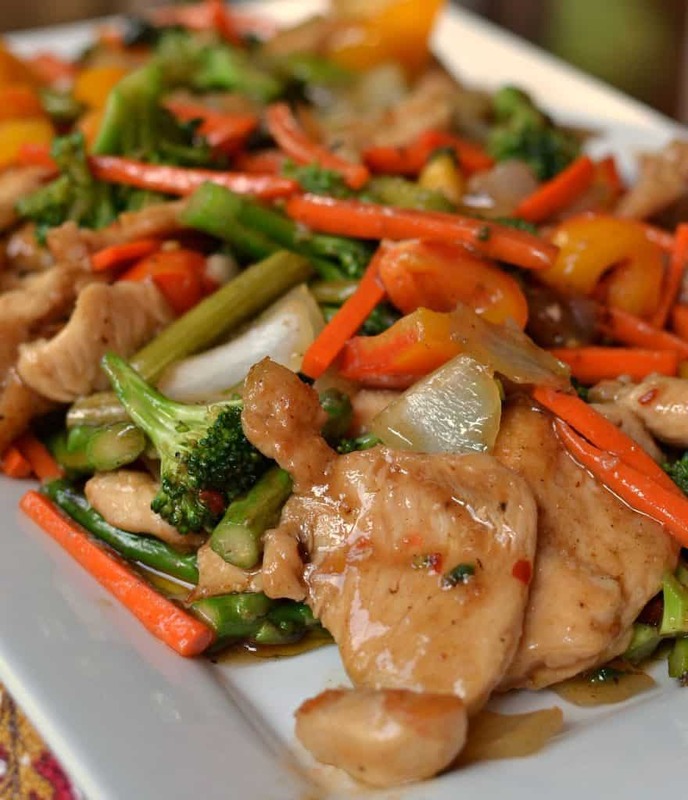 Basic Chicken Stir Fry is so quick to make using seasonal vegetables, an easy chicken marinade and a simple gravy that can be adjusted to taste. In large Ziploc bag combine chicken, soy sauce, ginger and cornstarch. Shake to coat. Marinate for 30 minutes turning frequently. Heat 1 tablespoon of oil over high heat in wok or large stainless steel skillet. Add chicken and cook stirring several times until the chicken is done; 3-4 minutes. Cook in small batches removing the cooked chicken to a plate. Heat 1 tablespoon of oil over high heat in wok Add onion and bell pepper and cook 2-3 minutes or until crisp tender; stirring frequently. Remove to plate with chicken. If necessary add another tablespoon of oil to wok over high heat. Add carrots, broccoli and asparagus and cook for 3-4 minutes; stirring frequently. Place lid on wok for the last minute of cooking. Remove vegetables to plate. In small bowl whisk together chicken broth, soy sauce, sesame oil, brown sugar, rice vinegar and cornstarch. If desired add ginger and/or sambel oleck. Pour into wok over low heat and whisk until thickened; 2-3 minutes. Return chicken and veggies to wok and warm. Serve immediately over rice or udon noodles. Make it weekly. Swap asparagus with snow peas or bok Choy, add straw mushrooms and water chestnuts. Alternate between boneless thighs , sliced pork tenderloin and shrimp. Serve with rice and egg rolls or dumplings. Delicious. Fantastic ideas! I love it! Thanks for the heads up!! Made this for my Mum & Daughter and they loved it. Tks. It was great. Thanks Marianne! I am glad that you loved it! My pleasure Jessica! I am glad that you liked it! This looks so filling! I can’t wait to try it! This has become a family favorite!! packed with flavor! Love stir fry!! This looks so delicious! I love everything in it, so I need to make it! Thanks! My pleasure Kristyn! I hope you enjoy it as much as we do! i love this recipe! its basic, its easy, its fast, and most importantly of all my family loved it too! i will be making this again. Thanks so much Krissy. I am glad that they liked it!